Passengers can take several roads in and out of Sacramento International Airport to get to the terminal to catch their flight. As the capital of California, there’s a lot to discover in San Francisco. Located 10 miles northwest of downtown, Sacramento International is a huge facility that perfectly exemplifies California’s sunny side. Enjoy your surroundings while you wait for your flight by shopping around or taking advantage of the helpful services provided by the volunteer airport staff. Whether you’re in need of hourly, daily, or long-term parking, the airport offers plenty of choices through the main parking garage, which connects to both terminals. 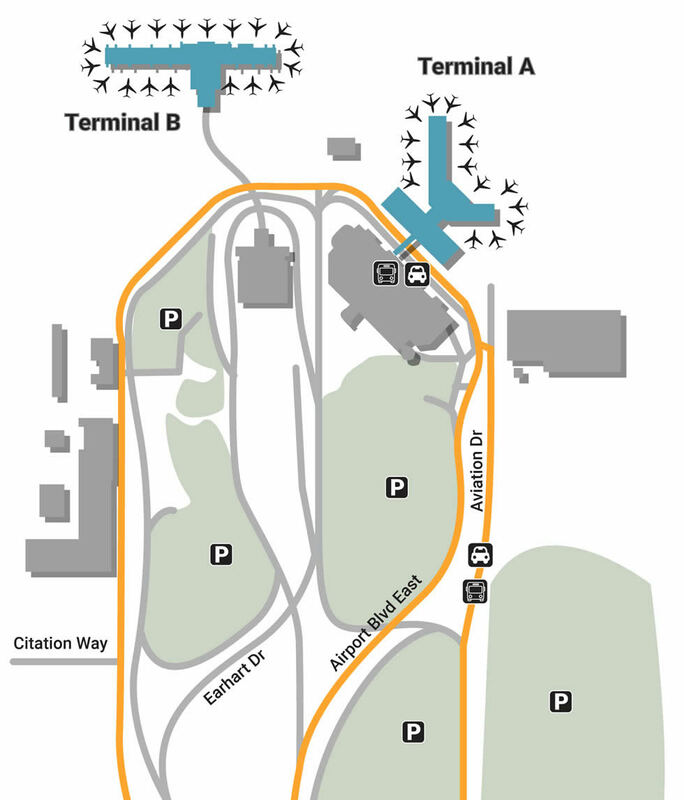 Hourly parking is closest to the Terminal B side, making it extra easy for travelers to get to their destination on time. If you’re interested in a lower daily rate, take advantage of what you’re offered in the covered garage spots, located in Terminal A’s 3rd floor as well as Terminal B’s 5th floor. There are also two daily lots located near the entry on Airport Boulevard. If you’re planning to leave for a very long time, drop your vehicle off at the Economy Lot, the cheapest location to enjoy your vacation. Rest assured that you’re not alone when you arrive, something that can easily be done by following the directions of Sacramento International’s accommodating airport staff. The facility is home to nine Chase ATMs as well as complimentary Wi-Fi that brings everyone together. If you’ve got a lot of luggage you need to take care of, grab a Smarte Carte to help you tote it around. There’s also accessibility for the disabled in the form of TDD telephones, visual paging, and braille signs, not to mention a huge selection of relaxing art, from the unique design of the carpet to the floating fixtures on the ceiling. They said a good meal brings a good day, so be sure to feed your day the right way by eating fresh at Freshii’s, a green restaurant that serves burritos, smoothies, and wraps along Terminal A’s Upper Level. If you’re in need of some liquid courage before your plane’s descent, head to Iron Horse Tavern next-door for a cozy atmosphere and tasty appetizers. Try some local by exploring other options at in the Terminal A food court, whether it be Paesanos, a pizza place that makes all their food fresh for each customer, or Squeeze Inn, home of the famous Sacramento cheese-skirt burger. If you’re thinking of just sitting in the lobby while you wait, think again. No trip is complete without a souvenir, something that can be done by walking through Terminal A’s upper-level shopping strip. Enjoy the gourmet food, apparel and crafts from Capitol Marketplace, or take in the elegant jewelry from Forever Silver. If you’re in need of some temporary entertainment, enter In Motion's vast array of trendy devices as well as special accessories, not to mention the countless movies & music that make flights go by easy.